Recycled Fashion: Upcycled Upholstery Patch Dress - Exhibition Worthy? Upcycled Upholstery Patch Dress - Exhibition Worthy? The City of Port Phillip Council is one of the few Melbourne municipal districts that invests in sustainable community activities. Historic events include Future Fashion Now a free event which showcased Melbourne, NSW and WA fashion designers, vintage suppliers, and crafty-persons that apply environmental or social sustainability principles to their creations and wares. The City of Port Phillip held a free upcycling workshop day in 2012, inviting artists in the Melbourne area to teach an upcycled skill to the general public. And lastly, in September 2012, the City of Port Phillip held a free Op Shop Tour by bike! This week, I received an interesting email in my inbox from the Sustainability Programs Department at Port Phillip Council, advising of an up and coming exhibition running in conjunction with the World Environment Day event in June. 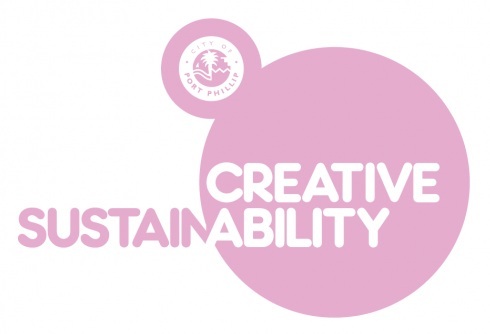 The Creative SustainAbility Exhibition focuses on 'local environmental themed artworks' which will be held at The Gallery at St Kilda Town Hall. The exhibition will run from Tuesday 29 May to Wednesday 26 June. I am not sure if my dress constitutes as 'art', however, I have put forward a detailed application to the City of Port Phillip, to display my dress in the exhibition, as well as one of my zipper brooches. I find out next week, if my pieces have been accepted, will keep you updated. Totally exhibition worth in my humble opinion. Good luck! The event definitely sounds like an interesting one to attend, too.